I read an article by Haruki Murakami in which he referred to his “kitchen table” novels – his first efforts that he wrote between shifts at his jazz bar. And I can relate. 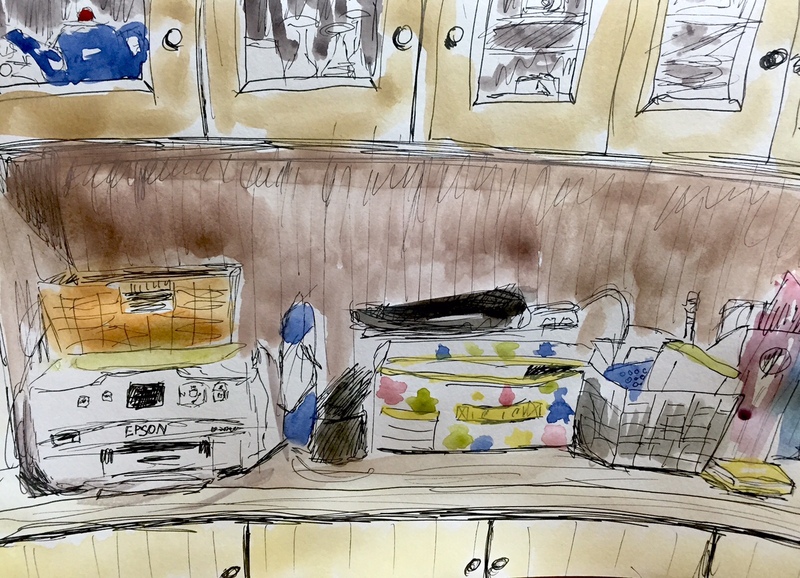 Though I don’t have a kitchen table (or jazz bar), this being the age of the laptop and smartphone and all that, I do have a living room counter that serves as the home office, which I sketched when I was too word blind to edit the latest work in progress, the second Hana Walker novel. Remember her? I’m thinking about various ways of promoting the second instalment, but ultimately writing good books is the best use of my time, between watercolours and blog posts, ahem. Aiming to finish the second draft of Hana Walker II this month as I’ve got a backlog of other projects to get on with.